Okay, so I’m really spoiled when it comes to open mics. I know that not every stage is going to be like the dedicated music room at Chicago’s Uncommon Ground with a captive audience and great sound system. But that’s what I’ve gotten used to, so I just want to fess up to that upfront. That being said, the open mic at Hopvine – just a few blocks from where I’m staying in Seattle – was a good place to pop my SeattleOpenMic cherry, if you will (and you will). First off, I really like this bar – I’ve already been here a couple times for drinks and food. Open mic night was pretty casual and lo-fi, the host was really friendly but kinda aloof. Overall the talent level was good (I’m not trying to be a snob, I’m just being real that an open mic with really bad musicians is a special kind of hell). It was a good vibe – seemed like the kind of gig where most of the people there are either regulars or friends of people who work there so it had a nice communal feel… at least abstractly. OH MAN I LOVE OPEN MICS…….. But really, what’s with Seattle having similar-sounding places as Chicago?? 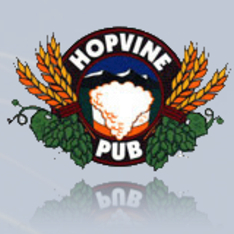 Double Door/Triple Door….. Hopleaf/Hopvine…. Come on now! Who’s copying who?? Next post better be about an exclusively Seattlean (Seattlian? Seattleite?) location!! haha yeah it’s been kinda bizarre… I mean, Chicago came first right? as a city? so I think the answer is clear. Heading to a show at The Crocodile tonight, and cannot think of any reptile-themed clubs in Chicago. Damn, just thought of the Cobra Lounge. but that’s a stretch…. I enjoyed the Tractor when I was out there. It’s the venue of choice when my friend Anne comes to Seattle to play. – Joy, I’m excited to have found your wtbsiee again! I followed you on xanga and never knew what happened to you after you got married. As always, beautiful work!